The first building in the new Manukau Tertiary Centre signals the beginning of a dramatic shift planned to occur to both the location and activities of Manukau city centre. 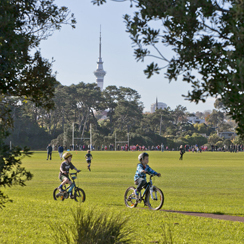 Bringing students into the city centre, train passengers into the tertiary building, and people back to Hayman Park will redefine the experience for visitors to the city centre of Auckland’s south. ​​​​​​​​​​​​​​​​​​​​​​​​​​​​​​​​​​​​​​​​​​The metropolitan city centre of Manukau is marooned somewhat​​, surrounded by the southern motorway and Great South Road to the east; the south-west motorway to the south; the southern rail line to the west; and Cavendish Drive to the north. Manukau Institute of Technology’s (MIT) mission is to improve educational outcomes within their community. The strategic brief for MIT’s new facility, the Manukau Tertiary Centre, envisaged the total elimination of physical and psychological barriers to accessing tertiary education. The strategic vision for Manukau city centre is to expand the focus of activity towards Hayman Park - a valuable resource for the city centre that has suffered from isolation and neglect. Activating a regenerational shift in the Hayman Park and ‘west of centre’ area of Manukau city centre is the first step in a series of built form initiatives to improve the connectivity, safety and destinational offer of the centre. The MIT/Manukau station development represents the first integrated design and construction of a trenched rail line in south Auckland and the first new rail line in Auckland for 82 years. The Manukau District Plan anticipated rail activity over Hayman Park, which enabled Kiwirail’s extension of the Southern Rail Line in 2012. This, in turn, provided MIT with the unique opportunity to incorporate a public transport interchange within the design of their educational facility. Stage One of the Manukau city centre development included 14,000m² of learning environment over nominally five levels. The M​asterplan prepared for the Tertiary Centre envisaged approximately 65,000m² of MIT space over future years. MIT's brief to the project designers was to break down the geographical, societal, and personal barriers between institution and community. The initial point of departure from a standard approach was the decision to locate the train station entrance within the Manukau Tertiary Centre building itself and to bring the building right to the street – locating a double-height, highly glazed entrance on the corner of Putney Way and Davies Avenue to maximise the legibility of the station. This also provided an important opportunity to repair the poorly defined existing streetscape, in anticipation of future development on adjacent sites linking back towards the core of the town centre. To extend the consequent opportunities beyond that of simple co-location towards the potential of true integration. 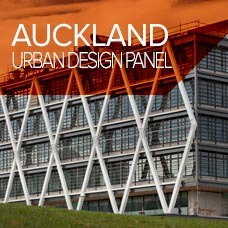 The project initially came before the Manukau City Council Urban Design Panel in October 2010. 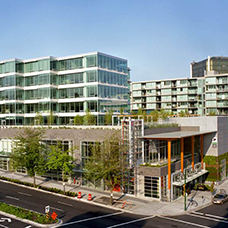 The urban design panel was supportive of the proposed combination of uses; however there was concern about the building’s relationship with surrounding streets and the form of future project stages to the west. Risk of the bus interchange along Davies Avenue becoming a compromised space lined with blank facades. The resulting design of the Manukau Tertiary Centre building knowingly blurs public and internal space to express openness and informality - an invitation to the community to freely enter within a neutral framework that will be filled by the life of MIT students and the surrounding community. Investing in durable design is critical for MIT. Commercial organisations come and go; educational institutes do not. We have to think in terms of decades, not years. 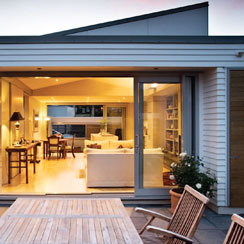 So we’ve designed for flexibility to future-proof the building. The pedagogical revolution in Manukau is only just beginning – and we’re using this building as the springboard for emerging teaching practices and technologies. It’s been a collaborative project. With Warren and Mahoney,MIT has worked in partnership with Auckland Council and Auckland Transport, and in continuous consultation with representatives from Māori, Pasifika, and local communities. This has created a learning environment that fits with the urban vision and that is woven into the community. The building is designed to be a cultura​​l destination – a centre for meeting, events and arts, a platform of transportation, and a place where the possibilities of learning are discovered. The ground floor café spaces extend out towards Hayman Park and provide more vibrancy to the city centre. Development of the Manukau city centre is all about bringing people to Manukau via warm, friendly and viable designs. With the MIT building now in place, the impact is dramatic. People’s perception of Manukau’s city centre is already changing - no longer are we just about the mall. The Manukau Tertiary Centre development is a truly unique development within Auckland – providing not only physical benefits to those who will use the building in the future but also striving to deliver social and economic benefits to the wider community.